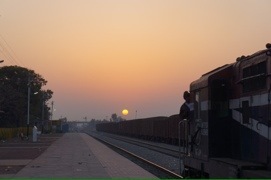 It is cold and dark at 5:45 when we are bustled into jeeps for Bundi station. This morning we face a journey of several hours on a local passenger train, second class (the ones that you see pictures of with people hanging out the open doors), and with no reserved seating it will be a free-for-all. Luggage and all. It’s fair to say that some of us are a little apprehensive. The train is delayed, so we are still on the platform as the sun appears over the horizon. When the train rumbles in, we race alongside looking for a carriage that might have spare seats. At first it seems that there are none – in my carriage someone is asleep across an entire seat. I hoist my pack onto the high bunk above the seat, moving a couple of suitcases along. Grudgingly, a small space appears on the seat below. Then a little more, until finally the prone figure gives way to the inevitable and sits up, gesturing for her companions on the other seat to join her. There is a general re-shuffle, and five of us have seats along a bench (which I’m pretty sure is designed for four). It sounds from the other compartments as though everyone else has managed to find a perch too. 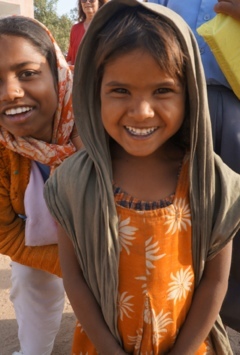 Meanwhile, the girls’ father has been chatting with the other Kiwis in our group, and the girls are visibly embarrassed when he too starts to sing, a song about friendship from a movie called Sholay (what’s the Hindi equivalent of “oh Daaaad!”?). He ignores their protests, and seems to be singing from the heart: it is actually pretty touching. One of the women removes a thin length of red wool, strung with beads, from her wrist, and ties it onto the wrist of one of my companions. 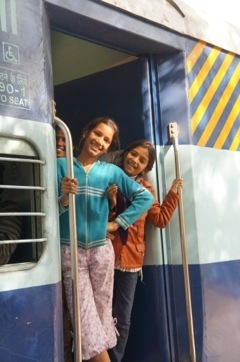 Then one of the little girls does the same, and soon we four women in the compartment are wearing rakhi bracelets. I’d heard that these are usually given by women to men who are then symbolically bound to them as brothers. I don’t know that these ones have any such deeper symbolism, but it’s a beautiful gesture. I’m struggling to think what I can give in return, and remember the small colourful cards that I had printed before I left London with my contact details – they’re not much, but they seem to be well received, and several other kids suddenly appear to claim one. I wonder if any of them will actually get in touch. All too soon it is time to leave the train, and the family, behind. As we cross the platform and turn to wave back at the train, the windows of our carriage are a sea of waving hands and smiling faces. 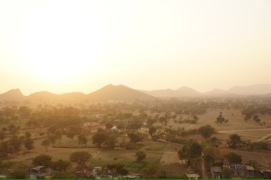 My next destination is Bundi, a small 12th century town in Southern Rajasthan, where Rudyard Kipling once stayed, and was said to have been inspired to begin “Kim”. 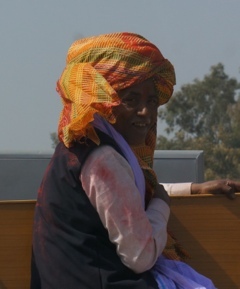 The little bus takes us across the desert, through plains and ravines, and through tiny villages with colourful murals painted on whitewashed walls. 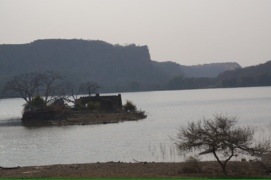 We stop near a deserted lake to stretch our legs, and as if by magic a man appears with a kettle and a cardboard box, to set up an impromptu chai stand and sweet stall. In the high season Intrepid passes through here once a week, so I’m sure he knew we were coming, but after the drive it is a welcome surprise all the same. In Bundi, our hotel was a British guest house during the Raj, with such luminaries as Lord Mountbatten on the guest list. These days it’s a humbler crowd, but the hotel retains a quaint charm, with high ceilings, impossibly high wooden beds and an assortment of curios in the dining room that ranges from a stuffed tiger’s head to an 1880s panorama of London to a pair of dolls with a terrifying stare, which look as though they could come alive at any moment. 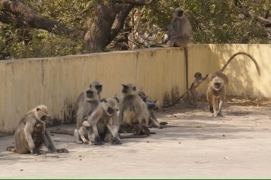 The roof has been colonised by a family of langurs, who allow us to share their space until the ratio of human to monkey is exceeded and, threatened, they bare their teeth and chase us back to the stairs. 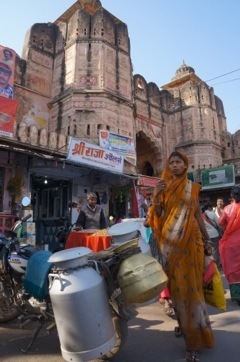 The hotel is just on the edge of town, a 15 minute amble to the old town where Bundi’s few tourists usually stay. Joghi, our host, takes us on a walking tour of his town. 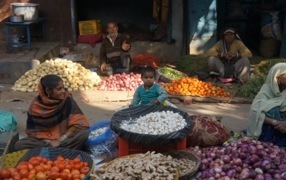 The main street into town is lined with market stalls selling fruit, vegetables, sugarcane juice and other standard items, but closer to town there is a more unusual trade. The street dentists have their wares laid out, false teeth and filthy instruments (with a sideline in cheap sunglasses, for reasons known only to themselves). 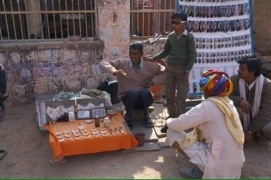 At one, an elderly man is having a tooth extracted. Small brown bottles of liquid opium sit ready to numb the pain. It’s all a bit much for our own resident dentist, who is utterly horrified, and refuses point blank to touch the instruments, which bear clear signs of their previous subjects. Can’t say I was keen, either. Moving away from the gory marketplace, we make our way towards one of the sites for which Bundi is best known, a large stepwell called the Raniji Ki Baori, built by the then-queen in 1699. 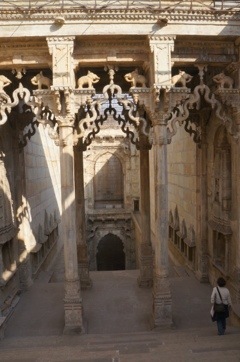 There were once around fifty step wells (“baori”) in Bundi, though many are now disused or covered over. The Rani ji ki baori is supposed to be the most beautiful. It is decorated with elaborate carving combining Hindu and Jain features. There is a barrier part way down the steps to the well, so it’s no longer possible to descend to the water, which is visible far below from a small bridge. In its day this would have been a hive of activity as local royalty came to sit near the cool water and escape the summer heat. From the stepwell we turn back towards the old town and wind our way through the marketplace, past locksmiths and spicesellers, through the main gate and up the steep hill towards the fort. 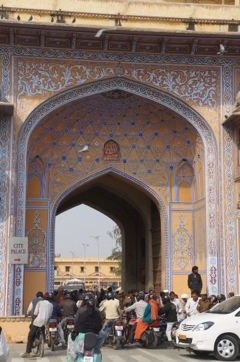 The gate of the fort is high enough to accommodate elephants. The building, once so magnificent that Kipling described it as “such a palace as men have built for themselves in uneasy dreams… the work of goblins rather than of men”, has been allowed to decline and disintegrate. Care is needed on the steps (look out for the giant wild beesnest over the gate). 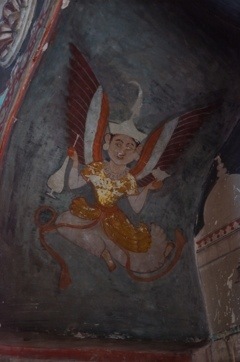 In some alcoves there are remnants of wall paintings, along with local graffiti. 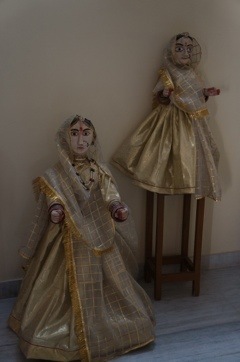 Up another narrow flight of stairs, we come to a room richly decorated with murals depicting women and men at play during Holi, and even an Indian angel or two. From the courtyard of the former womens’ quarters there are sweeping views over the city, and the lake below. Across the courtyard is a hidden room, which is unlocked as long as we promise not to take photos (and a couple of attendants watch closely to ensure we comply). Inside, every inch is covered in the most exquisite miniature paintings, save for a few gaps where gold leaf and decoration has been ripped from the wall by thieves. 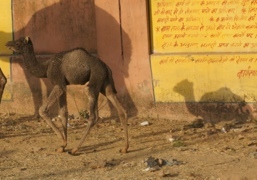 It’s the most amazing and unexpected sight amid the ruin of the building. 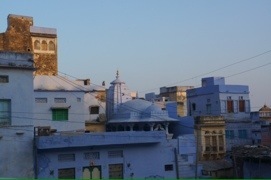 Outside I stop to take a few photos of the houses along the street, which are all painted blue – Jodhpur is known as the Blue City, but parts of Bundi are just as picturesque – well, except for the inescapable tangles of electrical cables…. Walking back through the town I notice that there are barely any touts – one street with guesthouses aimed at tourists, a few touristy shops, but the parts of Bundi that I have seen on this whistle-stop tour seem remarkably untouched. 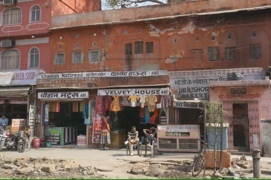 From Jaipur to Ranthambhore (my next stop) there is a long uncomfortable drive which takes all morning, with one stop at a forgettable touristy rest-stop cafe selling overpriced souvenirs. 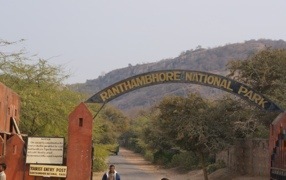 Ranthambhore National Park was one of the first parks set up under the Project Tiger scheme in the 1970s. It has an area of around 390 square kilometres, and (depending on which count you believe) maybe 30 tigers. So there is, in theory, a possibility that we might catch a glimpse of one. Unfortunately that possibility becomes increasingly slim and then vanishes altogether as we are loaded onto a large open-topped cantor truck, which then spends the next hour stopping at other resorts (including one which is a good twenty minutes past the park entrance) to pick up more customers. Chances of this lot staying quiet? Nil. Still, the drive into the heart of the park is very Indiana Jones, all crumbling stone paths and overhanging vines, leading to a fort which we can apparently return to explore at dawn. So. No tigers, then. 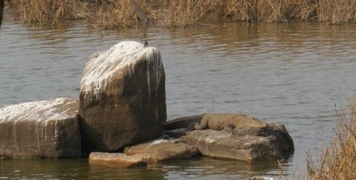 But we do see crocodiles lazing on an island in the middle of a lake, and plenty of deer. 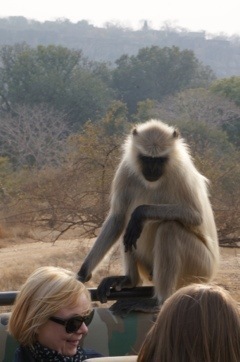 As we pass under a low branch, there is a thump and we unexpectedly pick up another passenger – a large langur, who inspects us lazily then decides the best seat is at the back, and climbs from seat to seat to perch behind us. After the squawks of surprise have receded and it becomes clear that we are not going to feed him, he allows the driver to chase him off the truck. The park is beautiful, in a dusty kind of way. 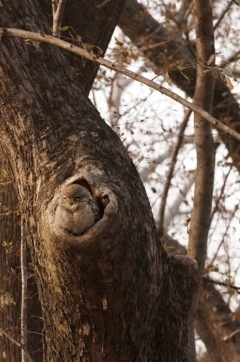 We see sleepy owlets perched in hollow branches, a snake-necked cormorant stretching itself into knots, more crocodiles (and drinking deer ignoring them), and a pair of mongeese streaking low across the ground. 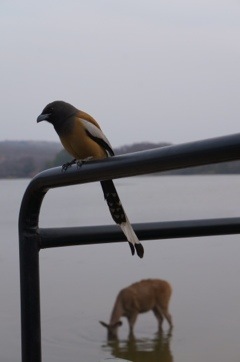 We stop by another lake, and attract the attention of some curious treepies – just like magpies, but yellow and black instead of black and white – and one drops down to perch on the cantor and take a closer look. The safari lasts about two hours, by which time the sun has set and it is getting seriously cold. By the end of the long reverse journey to drop everyone on the cantor back to their hotels, we are frozen, and nobody is interested in sitting outside to listen to the musicians the hotel has put on for us – instead we huddle in the restaurant for dinner and a couple of token drinks, then head straight to bed. 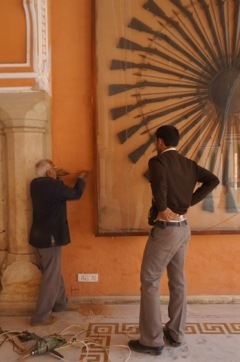 Other than the Amber Fort, there are three or four main “sights” to see in Jaipur. 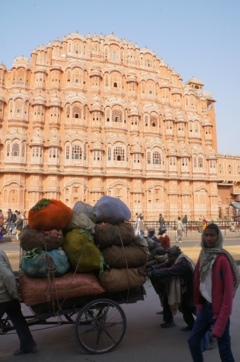 The exterior of the Hawa Mahal is one, and makes as good a landmark as any for the rickshaw to aim for. The adjacent shops are waking up, and an irritation of touts is out in force. 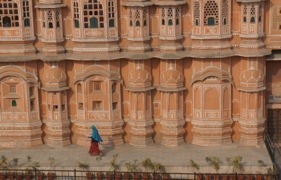 After brushing off persistent entreaties to take the stairs to a terrace (“best views of Hawa Mahal! No need to buy!”), I eventually cave and join the others up several narrow flights of stairs. The view IS good, though not significantly better, but we have been standing there only a few minutes when we hear drums down the street, and groups of men come into view, dancing and marching along with – yes, it’s an elephant! Riding the elephant is a guru (who our Indian companions identify as Ram Dev) dressed all in yellow, and horse-drawn carts of lesser VIPs follow behind. 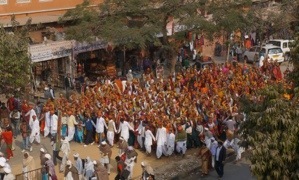 There are hundreds of white-clad men, then – behind a cordon of men holding hands to maintain formation – thousands of women in colourful village dress, bearing clay pots on their heads. The parade goes on for ages, long enough for us to bid farewell and descend from the terrace to take a closer look. 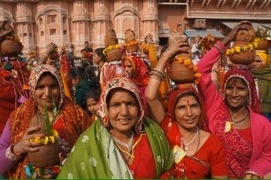 The women are friendly, and happy to be photographed (in fact some of them demand it!). 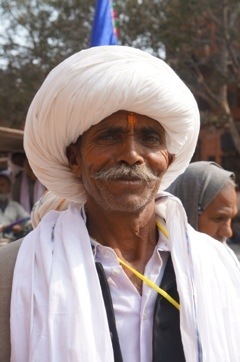 We cross and walk the length of the procession towards the source, a Krishna temple near the City Palace. 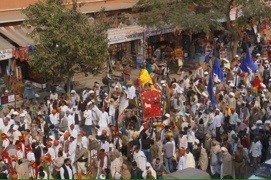 The parade of women eventually give way to men bearing huge indigo banners, and a line of tractors – one of which is carrying a huge poster of someone who looks a lot like Bob Marley – they are waving banners and cheering, until the tractor abruptly breaks down and has to be pushed ignominiously to one side. When we reach the old city gate, the last of the procession is coming through – a few incongruous white guys, also dolled up in white garments, riding horses (or donkeys), bring up the rear. Meanwhile the traffic has been building on either side of the gate, and we just manage to race through before every single vehicle tries to cross under the arch at once. 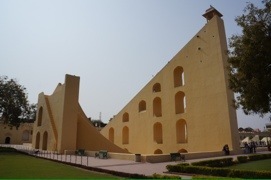 The sun is high in the sky, so we escape into the Jantar Mantar, across from the City Palace, and hire a guide (300 rupees split five ways), which proves extremely worthwhile. We are surrounded by odd-shaped sculptures, all curves and ramps, in varying sizes, painted terracotta and lemony yellow. 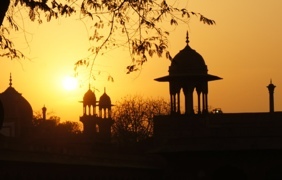 It’s a work of genius, a complete outdoor astronomical and astrological observatory, including the world’s largest sundial, created by trial and error and careful calculation (this is the fifth, and the only complete working version), in the 18th century by Maharajah Jai Singh II. There are sundials in different sizes for telling the time down to the nearest 20 seconds, a rotating star map with a hole for inserting a telescope, an inverted globe which shows the position of the constellations depending on the time of year (essential for determining a newborn child’s astrological charts at the exact moment of birth) – and all in perfect working order, as demonstrated by our guide (with the help of the sun overhead – don’t even bother visiting when it’s cloudy). There are even 12 separate instruments for the 12 star signs. It’s easy to imagine some kind of brotherhood of wizards in long gowns taking measurements and muttering over their findings – not entirely far from the truth…. Across the road we enter the City Palace, but it’s a bit of a let-down after the other palaces I’ve seen (save for the throne room, which has some fascinating pictures, which I wasn’t allowed to photograph – no postcards in the gift shop either, in an very rare instance of the locals missing a revenue-building trick). By this time we’re starving, so we negotiate with a rickshaw driver to take us to Natraj, a restaurant that has been recommended. Thinking we are getting a good deal we agree to a price if he will also take us to the local branch of the Himalaya herbal cosmetics chain. He agrees with such alacrity that I’m pretty sure we’ve been played – and the grin on his face is infectious when we pull up outside Natraj and he gestures to Himalaya – which is right across the street. Worth the extra 30 rupees for sheer comic value. Natraj has a hushed, formal atmosphere, and the food is fine (though not amazing). We try our luck with a rickshaw again, back to the Anokhi building on Prithviraj road, which also just happens to house a large branch of Crossword, the English-language bookshop, where I could happily spend an hour browsing through titles that just aren’t available in London (or, if they are, sell for twice the price). It is with some difficulty that I limit myself to three books, on the basis that I can send them home with a few other items when I get back to Delhi. Upstairs, the cafe at Anokhi proves to be every bit as fabulous as hoped, serving strong plunger coffee and exquisite rose and coconut cake (I really want the recipe!). 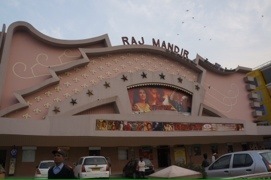 It’s an easy place to while away the afternoon before we have to meet the rest of the group, at the great Raj Mandir cinema: we’ve seen the filming, now it’s time to experience a Bollywood movie in all its glory. 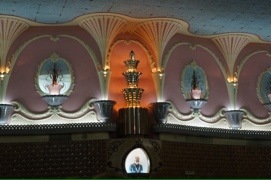 The Raj Mandir is a confection of a building, painted in candy pinks and greens and looking like it escaped from the twenties, though it’s only about thirty years old. We have paid 150 rupees for the top-price seats in the front row of the balcony, which gives us a perfect view of the rest of the crowd: going to the movies in India is an interactive experience. When the movie starts and the hero appears there are wild cheers, which turn to loud booing when the villain (dressed in black, of course) walks on. The movie is Agneepath (path of fire) starring the improbably good looking Hrithik Roshan, and it has all the elements of over-the-top, gripping action drama, with a hint of tragic romance thrown in for good measure (in Shakespearean terms, let’s just say it’s a tragedy). There are no subtitles but (with a little assistance from the plot summary on Wikipedia at half time) it’s not hard to follow the story. Back at the hotel after another wild rickshaw adventure, we are having supper in the restaurant and I’m idly watching the movie playing above the bar – some kind of childish comedy with a thin, preppy lead actor singing and dancing with a bunch of kids and a small alien – when I realise that the blue-green eyes look familiar. My suspicions are confirmed by the waiter – this is also Hrithik Roshan, five years earlier in a forgettable film (so forgettable I can’t remember its name), and he’s clearly spent a LOT of time in the gym since then. The Bollywood miracle? 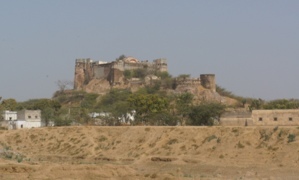 I know that the car is approaching Jaipur when we begin to climb a narrow road with ancient stone buildings closing in on the sides. 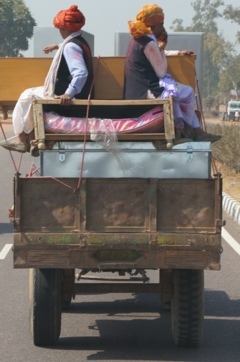 The traffic continues to follow the main tenet of Indian driving (at all costs, get in front), so it’s a slow journey. Coming over the pass and down into a valley we see a lake, and beyond on the hilltop a vast fort, with a high wall on either side, spanning the ridge line of the hills around us. 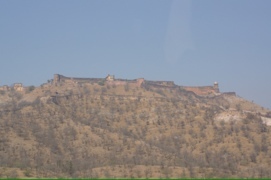 This is Amber Fort (confusingly, the ‘b’ seems to be silent), the present version of which was apparently built in about 1592 for a Rajput Maharaja. We drive most of the way though narrow medieval streets and up a steep cobbled road towards the vehicle entrance – it’s possible to climb the hill by elephant, but not a lot of fun for the elephant. Walking the rest of the way, we emerge in the main public courtyard, which is far more colourful than usual: market stalls have been erected, music is playing and orange, pink and blue banners are waving in the breeze. It takes a moment to realise that this is just a Bollywood set. In front of us a choreographer is taking the star, Abhishek Bachchan (son of the “godfather” of Bollywood, Amitabh), through his slightly wooden paces, while extra hang about and occasionally run to join in. In the two hours that we are at the fort, we must hear the same few lines of the same song a hundred times – apparently they have been at this song for three days, while the choreographer develops his/her “vision” for the piece. 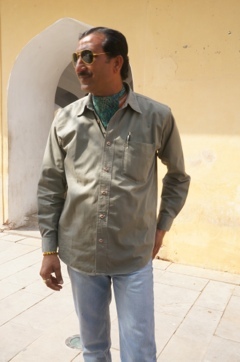 We are greeted by our tall, dashing guide, Mr Singh, who looks himself as if he has just stepped out of a Bollywood movie, with his raybans and cravat (I’ve never actually seen someone wear a cravat in real life!). He later admits (with some pride) to playing a general in a recent movie, Mission Istanbul. He leads us through the four courtyards of the palace, to the hall of mirrors and the hidden dancefloor from where the in-crowd could not be seen, but could still observe the public goings-on below. 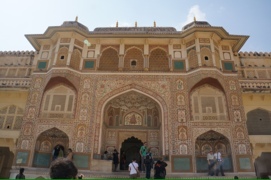 There are gardens, water features, elaborate zenana apartments (with a private entrance so the maharaja could visit his favoured wife in secret), stained glass and painted ceilings. There are rooms for winter use, mirrored to make the most of the sunlight, and summer rooms with water features and hooks for hanging fans. When one maharaja’s mother lost the use of her legs (our guide: “she no longer wished to walk”), ramps were built throughout her quarters and parts of the palace so that she could be wheeled from level to level in a rare early nod to accessibility. 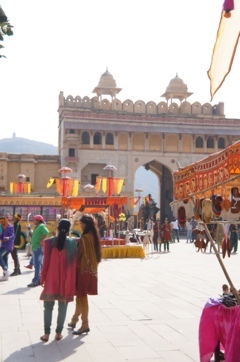 When we emerge from the palaces to the main courtyard of the fort, the Bollywood crew are still going strong. 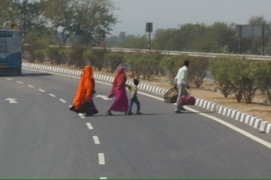 Leaving them to it we drive the 11km into Jaipur, and seem to just about drive right out the other side. Our hotel, where we are greeted with garlands of marigolds, is quite lovely – the nicest yet – in heritage style, with large rooms and corridors lined with sepia prints of maharajahs past and some rather disturbing hunting parties from bye-gone days. 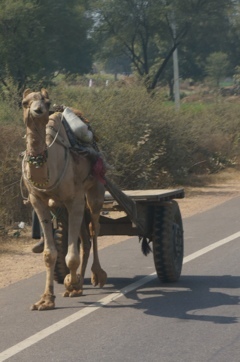 It is, however, a good twenty minutes or more by bumpy rickshaw from the centre of town, and the rickshaw drivers in Jaipur are the craziest yet. 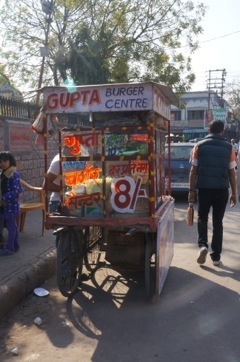 After lunch, we take rickshaws back to the old walled city, which was meticulously planned by Maharajah Jai Singh and built in the early 1700s – right down to the grid pattern of the streets and the numbering system for each of the shops. Our trip leader takes us for a walk through the old city, from the City Palace to the terracotta-coloured Hawa Mahal, or Palace of the wind, then through the bazaar towards the newer part of town – Jaipur is famous for its silver and gems, and some of the group have serious shopping to do, so we are headed for some of the more reputable shops. I’m not in the market for silver or gems, so after admiring the jewels for a few minutes I head to Anokhi: the original branch of the small fair trade clothing chain that we discovered at Khan Market is here in Jaipur – and they are having a sale! They are also having an invasion of pushy Chinese tourists, and a severe staff shortage, and it turns out I’m not feeling as patient as I could be, so after a quick look it’s time to head back to the hotel. On the way out I notice a cafe attached, which promises safe salads, homemade breads and cakes, and best of all plunger coffee! 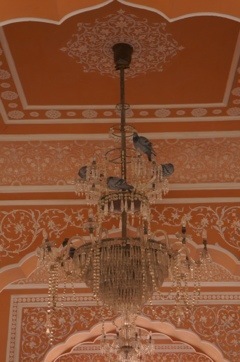 I plan to return and try it out before I leave Jaipur. 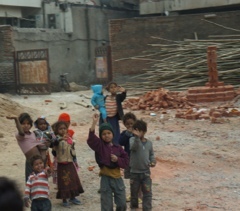 Waving goodbye to the kids from the construction site, we hit the main highway, heading for a tiny village in the middle of nowhere, and a fort called Madogarh. There has been some trepidation about this leg, as we are travelling by public bus and everyone has heard horror stories, but we shouldn’t have worried: it’s a regular intercity bus with comfortable, allocated seats – no need to sit on our packs in the aisles as we might on a local bus. 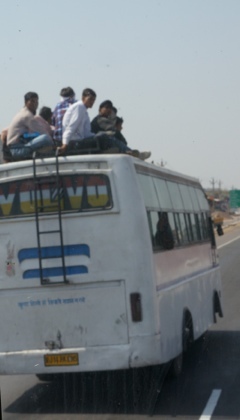 I notice a girl sitting on a fold-up seat at the very front, next to the driver. She has the best view of all, so when she gets off a little down the road I grab my camera and abandon the comfortable seat for one with a view. Abandoning the bus, we switch to jeeps for an hour or so, driving into the desert past the occasional village, flat cakes of dung drying on the walls to fuel cooking fires. At last we spot a hill in the distance, on which sits a fort straight out of a fairy tale. 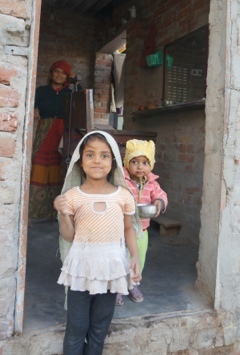 This is Madogarh, and this is our home for the night – just the twelve of us! The jeeps take us through the village at the foot of the hill and up the steep track to the fort, past a road crew who are painstakingly covering the track with cobblestones. 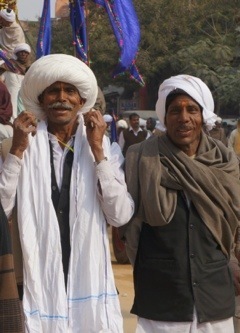 Two tall turbaned men wait to greet us with red powder to mark our foreheads. 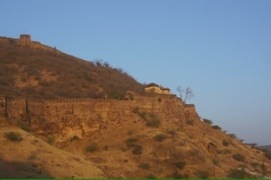 Each room is different, built into the walls of the fort. Mine is just behind the battlements, which can be reached up three stone steps to provide sweeping views of the countryside. There is time in the afternoon for a walk through the village with the manager of the fort, a tall man in a military beret, with a magnificent moustache, who turns out to be a bit of a dancer later in the evening. We are followed by a trail of local kids most of the way, past the local potter, weavers making a rug at a huge loom, craftworkers attaching sequins to sari fabric, and a detour into the local school to deliver those boxes of pencils (wishing we had something a little more exciting to give), which causes immediate suspension of classes as the kids crowd around for “one photo!”. We visit a workshop where women are polishing small beads and making necklaces, and another small shop where a whole family is at work melting and shaping resin to make colourful bangles, the daughter painstakingly sticking diamantes into the soft edges. 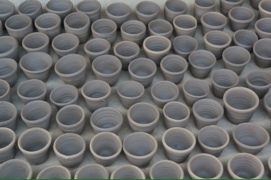 There is time for chai, where we are served the throwaway clay cups which we saw the potter making earlier. It definitely adds another dimension to the taste. Back at the fort, there is beer on the turret “bar”, then we have a surprise in store: a local woman has come up from the village to dress all of the women in traditional dress, while the men learn the finer arts of rolling a turban. 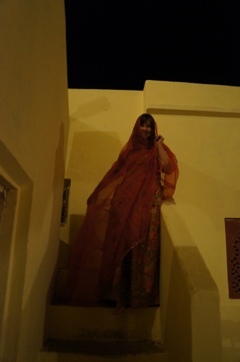 The finished result has us in stitches, but we definitely look the part as we descend to the courtyard, where dinner is served by firelight, and local musicians play the sitar and harmonium into the night. I am up with the sparrows the next morning, taking my camera to the rooftop to watch the dawn. In the main village temple I can see flickering lamps, and the sound of the bells and drums signifying morning prayer wafts up the hill. I can see little lights across the plains below until, abruptly, the power goes out and all is dark. 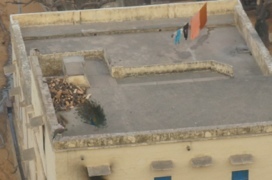 With sunrise come the birds, and there is a hilarious pantomime played out on a rooftop below as a peacock does his best to display his colours to an uninterested peahen. He turns away to show his feathers to greater effect, and she takes her chance and jumps. He looks distinctly confused when he finally turns around to an empty rooftop. 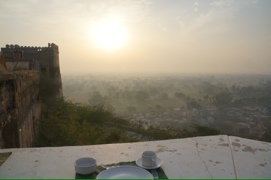 Breakfast is served on a turret, with the most amazing breakfast view so far. It’s Valentine’s Day, and in the tiny gift shop a local painter is offering special deals on miniature portraits of Krishna with his favourite girlfriend, Radhe (he had 16,000 to choose from, apparently, but she was definitely number one). It strikes me that this place would be the perfect writers’ retreat. No internet or TV to distract (in fact, nothing to distract but the view), and peace and quiet in abundance. 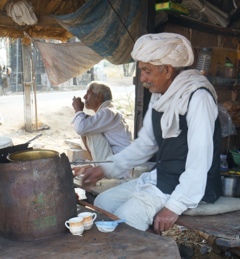 A wander down the hill to the chaiwallah now and again to break the day… It definitely could be worse! 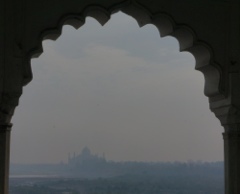 Agra: A love story and a dysfunctional family. It is pitch black outside when we leave for New Delhi station to catch the Shatabdi (express) to Agra, leaving early to make the most of our single day there. 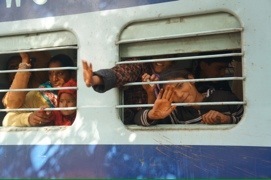 The train is easily the nicest I’ve been on, and is apparently the fastest in India. It’s also full of package tourists, and a new game of “American tourist bingo” (in the vein of Auroville bingo) is soon in progress. I imagine someone somewhere is playing a similar game of Intrepid Travel bingo…. or backpacker bingo, perhaps. 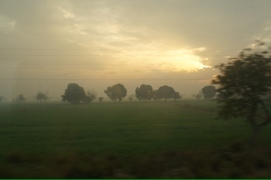 We watch the sun rise over the villages and fields as we speed by. 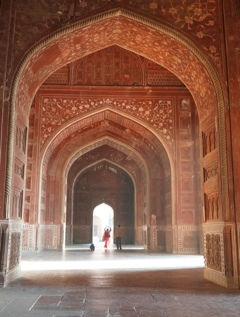 A couple of hours later we are in Agra, bound for the Red Fort and one of the best guides of the trip. If only I could remember his name! 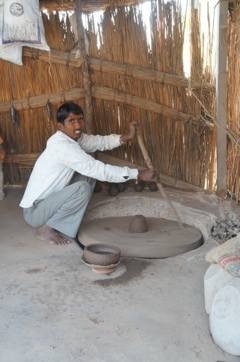 He is passionate about the history of the fort and the Mughals, and manages to convey the details of daily life in the fort in a way that really brings the building alive. 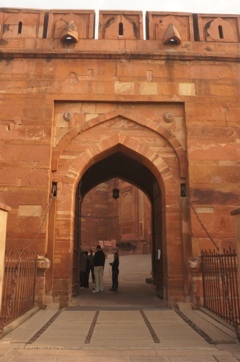 The fort is huge, built of red sandstone blocks with a moat and drawbridge, and a surprising number of small palaces inside. 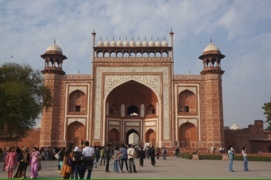 It was built by Akbar (son of Humayun) in 1565 or thereabouts. 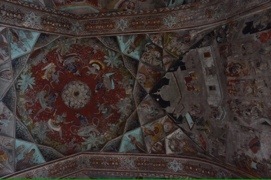 We see the beautifully decorated rooms where Akbar’s grandson Shah Jehan ended his days before joining his beloved Mumtaz in the Taj Mahal (he was kept under house arrest for spending too much money on monuments, among other pretexts, by his youngest son, Aurangzeb – plotting with his sister and having killed his remaining brothers to secure succession, a familial trait). We check in to our hotel (which is your average clean, tidy business hotel, everything works but not a lot of personality), and are mobbed by the kids whose parents are working on the construction site next door. 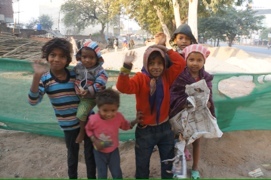 They’re not asking for anything (though it’s clear they don’t have much); they’re just curious and want to say hello. Heartbreakingly cute. Or actually, just heartbreaking. 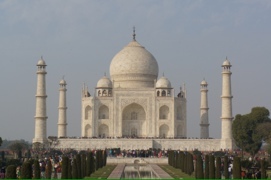 Lunch is at a touristy place with a roof terrace, and I notice that the prices are higher than they were in the south – though it could just be that we are a captive market: there’s not much else going on in Agra, and it’s a bit of a dive, save for the Red Fort and the main attraction. 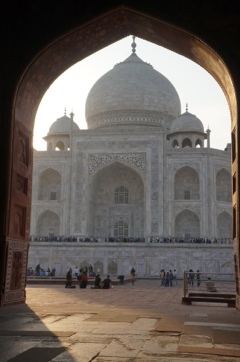 The best time to see the Taj Mahal is at sunrise or at sunset, and it’s late afternoon when we finally arrive. There is the usual phalanx of touts to ignore, and a queue for security (no food to be brought in either). We are given paper slippers to wear over our shoes when we get to the tomb, and pointed towards the main entrance. Even the entrance gate is a spectacular arch of sandstone. 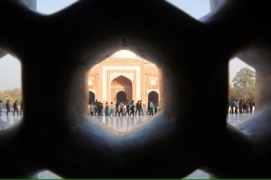 The tip of the Taj Mahal is visible behind, but it is still a majestic sight when I step through the archway. There is a steep foreign price (750 rupees! 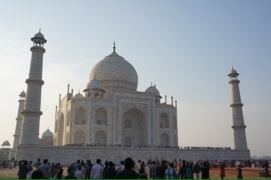 ), and a much cheaper Indian fee, but the advantage of the foreign ticket is that you get to skip the gigantic queue that snakes all the way around the building. Inside, there are strictly no photos, and crowd control is fierce. All is symmetrical, save for the slightly higher marble box that is Shah Jehan’s tomb – the building was not designed with him in mind. 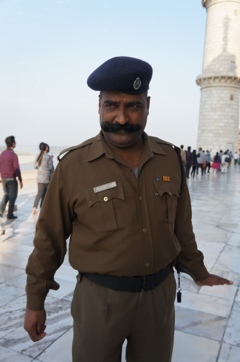 Outside, the Yamuna river snakes past, and we sneak a couple of pictures before we are swiftly moved on by another man in a beret with yet another magnificent moustache. 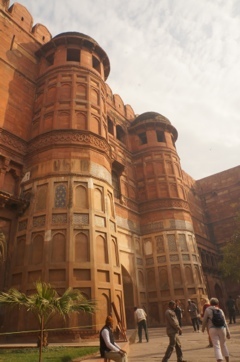 On either side of the main tomb are red sandstone mosques, one of which still operates, and the other which is open to tourists (behind a slightly confusing “Indians only” sign, which turns out to relate to the queue for the Taj Mahal, not the mosque). 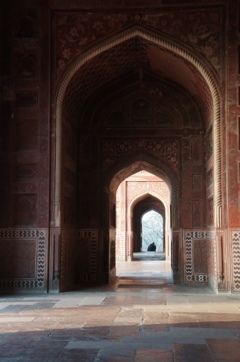 A young couple sits together holding hands at the end of an arched corridor, which seems kind of fitting for a place which was built to commemorate a great love. 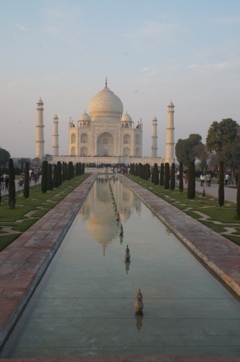 The sun is low in the sky as we leave, providing plenty of opportunity for pictures of the Taj mirrored in the fountains. That night there is a wedding celebration in the hotel, the gardens decked out in shiny ribbon and the members of the brass wedding band each playing a different tune again – the modern version of an Indian love story is a bit more clamourous and colourful than its predecessor.